Discussion in 'Other Sport' started by pauldyson1uk, Nov 28, 2017. The 2018 F1 season will begin in Australia on March 25, the same weekend as this year, and end in Abu Dhabi on November 25. The Azerbaijan GP in Baku will take place two months earlier on April 29, while the Russian GP in Sochi has been moved back to a late September slot after hosting this year's fourth round. But the major talking point is the three grands prix in three weekends - an F1 first. The hypersoft is the "best tyre Pirelli have produced since returning to F1", according to world champion Lewis Hamilton after sampling 2018's tyres for the first time. The new-for-2108 compound is two sets softer than the ultrasoft, the quickest tyre in Pirelli's 2017 portfolio. Kimi Raikkonen used the pink-coloured tyre to set the pace on day one of the post-season Pirelli test at Abu Dhabi on Tuesday with Hamilton, in his last on-track outing of the year, third fastest. "I'm not really the biggest fan of testing, but it's been a positive first day of running with these new tyres," said Hamilton. "We've got a good early understanding of these 2018 Pirelli tyres. On early impression, the new HyperSoft is the best tyre that Pirelli have produced since returning to F1. I found that the other compounds are still a bit too hard for my liking but we're moving in the right direction. It's a nice way to wrap up the season, with one last day in the W08." McLaren's Fernando Alonso also offered a positive first impression of the 2018 tyres. "It's been very useful for us to have a read on the 2018 tyres," he said. "They felt good, I felt the performance was there and the degradation was under control, so generally I had a good feeling." Like Hamilton and Raikkonen, the session marked the end of Alonso's on-track activities this year and the Spaniard added: "I'll be back in the factory soon for seat fit preparations and development work for 2018. There's a lot going on and I'm very happy with the direction for next year." Would love Kubica to make a comeback. Even if he's a half second off the pace it would be an incredible story. One of my all-time favourite drivers. I think we could see him in a Willams car in 2018. Kubica completed exactly 100 laps and recorded a best time of 1:41.296 which placed him only ninth in the timesheet, but set on the soft tyre. Set in similarly hot day-time conditions, it was slightly faster than Williams race driver Lance Stroll's quickest lap in Practice One of the Abu Dhabi GP last Friday, although car and fuel settings are unknown. "What the future will bring, I do not know, if nothing else happens there will be disappointment because I feel confident and comfortable," said Kubica. Having not driven an F1 car for over six years before this summer, Kubica believes he has made good progress in the tests he has completed since and insists the arm injuries which had appeared to end his career are not signifcantly impairing him. "I am starting from scratch because F1 has changed so much over the past seven years, but the experience I gained while racing in F1 has helped me to get on top of the learning process," he added. "I have some limitations and I have to adapt, but one positive thing is how my body is reacting and how natural I feel every day when I am driving these cars, so that gives me a lot of confidence." yeah quite a few , I will be posting them soon. Alfa Romeo name returning to F1 in 2018 in Sauber tie-up. The Alfa Romeo name will return to F1 with Sauber in 2018 after the two parties agreed a wide-ranging technical partnership. The Swiss team will officially be known as Alfa Romeo Sauber F1 Team with the Italian car brand to be their new title sponsor. Sauber are powered by Ferrari engines and Sergio Marchionne, the president of the Maranello marque and the Fiat-Chrysler empire, had been keen to see the Alfa Romeo brand return to F1 for the first time since 1985. The partnership is being billed as 'strategic, commercial and technological cooperation between Alfa Romeo and the Sauber F1 Team'. Sauber are still to confirm their driver line-up for 2018, but Ferrari-backed Charles Leclerc and Marcus Ericsson are the most likely pairing. Both are running in this week's post-season Abu Dhabi test. "This agreement with the Sauber F1 Team is a significant step in the reshaping of the Alfa Romeo brand, which will return to Formula 1 after an absence of more than 30 years," said Marchionne in a statement. Maybe if we don't mention the halo til March we can pretend it isn't happening. This is quite a good read about Halo. Robert Kubica posted Williams' best time of the post-season Abu Dhabi Pirelli tyre test as he rounded off his third test for the team. The Pole posted a best time of 1:39.485 to place him seventh in the timesheet, and was a tenth quicker than Lance Stroll managed on the same hypersoft tyre on Tuesday. Kubica drove 28 laps during the final two hours of Wednesday's running to add to the 100 laps he managed on Tuesday, after which he had said he felt "confident and comfortable". This test is being viewed as Williams' final check on whether the Pole is physically able to make a full-time return to F1 in 2018. Honda have overhauled their F1 management structure in the wake of their divorce from McLaren. F1 chief Yusuke Hasegawa has been replaced with his role to now be split in half as Honda team up with Toro Rosso from 2018 - with a technical director installed to oversee operations at the race track, while an operating officer heads up engine development in Japan. I doubt it will happen. Force India have signed Canadian Nicholas Latifi as reserve and test driver for the 2018 F1 season. The 22-year-old Latifi will provide back up to race drivers Sergio Perez and Esteban Ocon and appear in "a number of" Friday practice sessions during the year, in addition to in-season tests. Latifi finished fifth in last year's Formula 2 championship, winning at Silverstone, and had been linked with a similar role at Williams. "I'm really excited about the opportunity," said Latifi. "Sahara Force India is a team that has shown constant improvement for the last few years and I'm proud to become a part of one of the success stories of Formula 1. I am eager to show the team what I can do and help them as they continue to close the gap to the front of the grid." Just putting this here. Would love to get back into F1 like I did in my teens. Sergey Sirotkin has beaten Robert Kubica to the final seat on the 2018 Formula 1 grid at Williams. The 22-year-old Sirotkin, who is thought to bring considerable sponsorship money to the team, completes the 20-driver field for next season. The Russian will partner 19-year-old Lance Stroll in the youngest line-up in the sport. Sirotkin has never raced in F1 but drove in four Friday Practice sessions for Renault in 2017. "To say I'm happy and proud to join such a famous team like Williams is an understatement," said Sirotkin. "It took a huge amount of work to get where I am, and I'm really happy and thankful to everyone involved. The result of our combined efforts has helped me achieve my dream, and rest assured the team can rely on me to deliver my best." WILLIAMS MARTINI RACING is pleased to announce Robert Kubica as its Reserve and Development Driver for the 2018 Formula One season. 62 days till the start of the new season. Apparently there wont be any 'walk on' girls any longer from this season onward. Why have the start times changed? F1's new owners, Liberty Media, believe moving the start-time of races to 10 minutes past the hour will improve experience of TV viewers. Additionally, the hope is that the later starts in Europe and Brazil will increase TV audiences by making the sport more accommodating. First time startiing of the 2018 Merc, Twelve calendar months, a thousand man years in the making. And now, a first milestone passed. Grid Girls out , Grid Kids In. A new documentary about McLaren’s 2017 season is up on Amazon Prime. Pretty interesting so far. Edit: Is the 4 part series Grand Prix Driver? Yeah, the episodes are only 30 minutes long. Guess I should sort my team out lol. Yes, only 38 days till the first race of the season. The website is now open for team to pick teams for this season, there is a league already set up. I quite like this idea, not sure if it will work in practise. It is a special livery, not sure if it will race looking like this. Renault and Sauber unveil theirs next, both on the 20th. 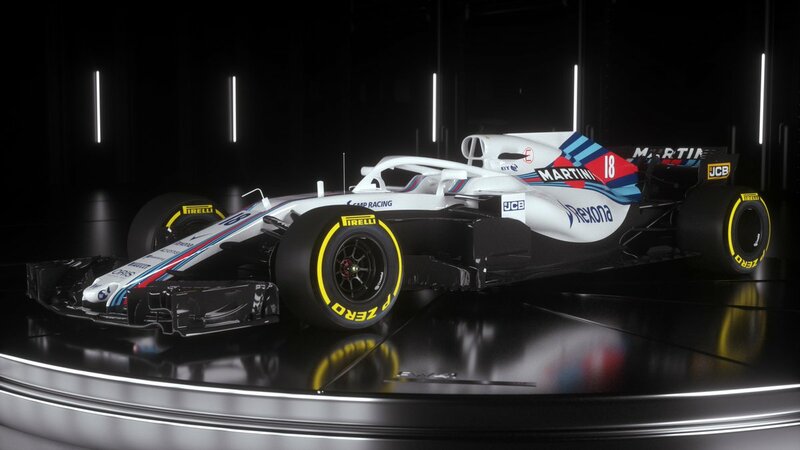 From the cars unveiled so far, the halo does not look too bad.